Given the modern diversity and uniqueness of America’s massive art industry, it is difficult to comprehend that until a century ago America lacked its own original art scene. America’s artistic community largely depended on developments made in Europe. American artists simply mimicked European styles and content; European artists were regarded as superior to their American imitators. A new exhibit at the High Museum of Art, “Cross Country: The Power of Place in American Art, 1915–1950,” presents the history of the artistic revolution that differentiated American art. The exhibit is organized geographically, a format that highlights how this period saw a transformation in art from every part of the country. This dramatic change in the early 20th century was particularly motivated by the onset of the Great Depression. The Depression created a distinctly American sense of collective suffering that artists sought to depict. For the first time, artists linked the ideas they expressed with America itself; in order to highlight this link, they gravitated towards content inspired by the American landscape. This revolution in the content of American art was paired with the rapid expansion of the art scene’s accessibility. Due to government grants distributed to artists through programs like the Works Progress Administration, ordinary Americans could, for the first time, afford to create art. This early 20th century American artistic revolution truly constitutes the birth of all modern American art, from Norman Rockwell to Andy Warhol. The exhibit was originally developed at the Brandywine River Museum of Art in Pennsylvania, but it was moved and expanded to occupy the larger High Museum. The collection includes works from some of the most iconic artists from the period, including Georgia O’Keeffe and Ansel Adams, as well as many from lesser known artists of the time. In addition to varying in style and content between individual artists, the exhibit highlights the unique ways in which the art revolution manifested itself in different American regions. Visitors to the exhibit travel through the different regions one by one, and the sections on each region were designed to feature the major themes on which artists from those regions focused. The focus of the Western art section is the American landscape while that of the Midwestern and Mid-Atlantic sections is the homestead and the steady replacement of agriculture by industry. With winter as a common motif, the section on the Northeast examines New England’s farms and villages, and the Southern section centers on race and poverty. 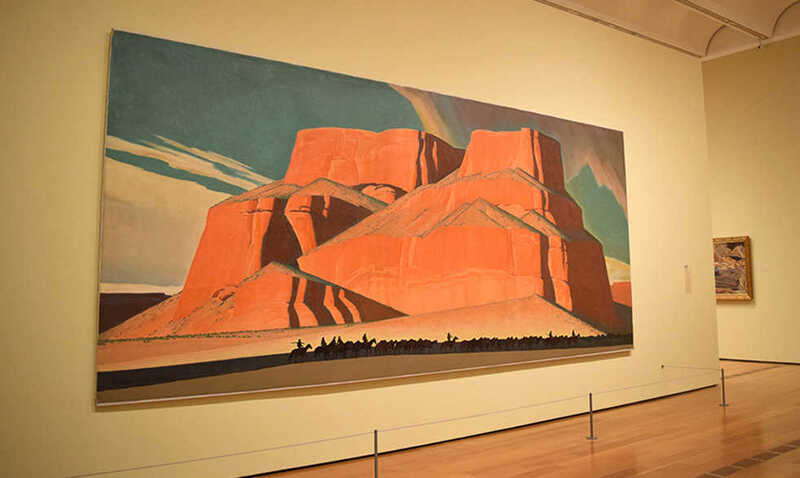 This regional format, while highlighting the differences in the art from America’s regions during the period, is essential to the unity of the exhibit’s central idea. The format allows visitors to appreciate the variety of the themes examined in the movement while making obvious the common focus of all art from the period. In every region, artists rejected traditional styles from Europe and developed original American styles for the first time. Artists matched these new styles with a renewed interest in America’s unique natural and artificial landscapes. The curators of the exhibit developed a design that effectively and powerfully demonstrates the unity of the focus of American artists working in a diverse array of styles and regions in the early twentieth century. Demuth depicts the industrial view from a humble American garden, juxtaposing the American simplicity of the painting’s content with the European grandeur evoked by its title. This painting could serve as a thesis statement for the exhibit as a whole, showing how American artists during the period developed their own art tradition and challenged the European monopoly on art. While the exhibit is quite educational, visitors do not need an art degree to enjoy it; those who miss its point can still enjoy the beautiful artwork. “Cross Country” runs through May 7, and visitors can receive free entry to the High Museum on the second Sunday of every month.